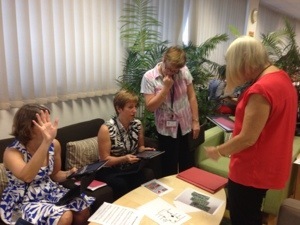 Thrilled with this endorsement of technology for learning from our Inspection report. OneNote was a major factor! When we conduct KS3 speaking assessments, teachers generally bring each student to a corner of the class (or just outside) and have an unrecorded conversation. Some teachers tick boxes or otherwise take notes on a paper rubric while this is happening. I have never really liked doing this, preferring to concentrate on what the student is saying, and recording the dialogue to listen to later for considered grading and feedback. This time I used Showbie to make this process easier. I created an assignment in Showbie called Speaking Assessment, and in the class shared folder space put a screenshot of the rubric. As each student sat down, I opened their folder within that assignment and recorded our conversation using the Voice comment feature. Later, at home, I played each recording, simultaneously noting good structures with my stylus on the copy of the rubric in their folder. Next time, I will get student to listen to themselves and fill the rubric in , I will only add things they missed, both positive aspects and areas for improvement. The latest update to Showbie, now a staple app in our school, is the ability for students and teachers to add multiple audio clips over the top of a PDF or image. This immediately offers more options for precise audio placement than the existing standalone audio comment which is separate from the work itself. Teacher distributes image or PDF of an exam qn, student writes or types their answer with an accompanying audio explaining their thinking. I could see this working for any subject area. Any ideas you can think of? Please share! what did you enjoy learning this year? what did you find hard this year? what did you find easy this year? to what extent do you like working independently? 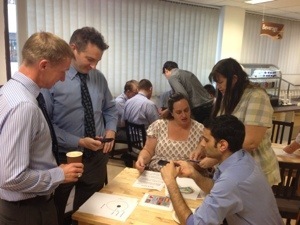 to what extent do you like working collaboratively? what could I do as a teacher to help you improve more effectively? I encouraged students to be really honest but kind, both about themselves and about my approaches to teaching and learning. The responses were varied and detailed and told me a huge amount about the way these children perceived their personal strengths and challenges, as well as the way I had set up their learning. All questions provided me with answers that confirmed or challenged my perceptions, provided rich details that I could mention in my written reports, and enabled me to reflect on which of my teaching and learning approaches were most/least welcomed, and why. I found out that the students had overwhelmingly enjoyed the collaborative classroom I set up and stuck with all year (small mixed -ability teams sitting in groups with Spanish animal name identities such as Pumas, Lobos, Tiburones etc) All games, quizzes and probably 80% of all classroom activities were collaborative in nature, even helping each other write the date accurately, reminding teammates to remember headphones etc, so there was great evidence for me to comment in their reports whether they had been leaders, passengers, mentors etc in this environment. It was encouraging that some students referred to participation/collaboration as a help or as an improvement goal, without any prompting from me. I also found out that some students do like still like good old paper..no harm reminding myself to keep learning blended! I definitely did fewer songs this year, that’s something for me to work back in, too. Lastly, it was good to get a reminder that we need to take more risks as teachers planning curriculum content, clearly, not all 12 year olds find learning pencil case items thrilling. I have done this kind of feedback form before..have you done something similar? How do you think it could be improved? 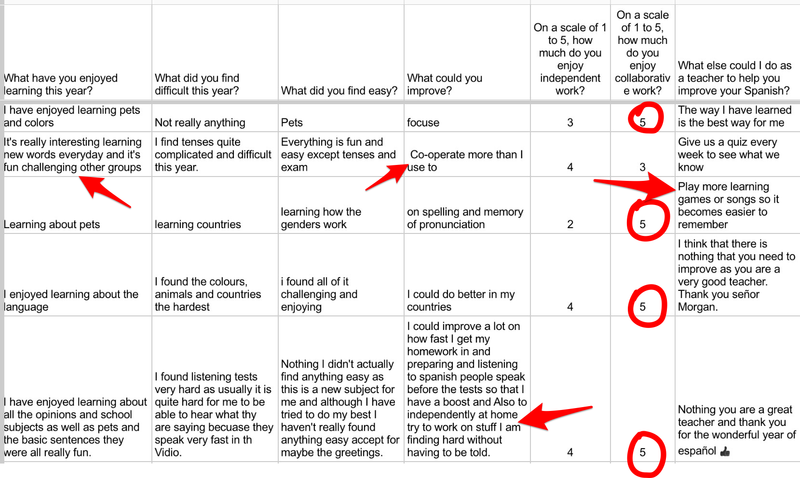 I had a thought of starting next year with a similar survey, to find out how students perceive themselves in these areas, learning styles etc to use as a benchmark, then compare how they change over the year. Time for a nap now. This has been a busy year. We have nearly completed the third year of our 4-year tablet rollout so that, currently, students in Years 7 to 10 all bring their own iPads. 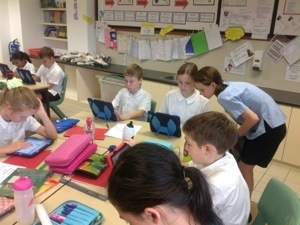 This gradual rollout has had two main benefits: Firstly, and this was the main intention, teachers have not been overwhelmed by a feeling of having to suddenly integrate technology with every class, instead they have had time to think about, try out and share opportunities for curriculum and learning experiences for certain groups. Secondly, teachers who were somewhat or very resistant to any devices in student hands are now in the position where they are eager for the remaining year groups to have the same opportunities for creativity, independence etc. Professionally, I attended a demanding 5 day Apple Learning Academy and qualified as an Apple Foundations Trainer. I have been enjoying delivering certified training this year to over 130 colleagues on Apple iWork and iLife apps. Next I plan to become a Google Educator in October. Our model for supporting teachers in the effective adoption of technology has been been evolving over the last few years and is about to change again quite radically. From the inception of The Technology for Learning Faculty four years ago, the model has essentially been to have a team of subject-specific ‘champions’ (each with a couple of hours release time and meeting fortnightly with me) across the English, Maths/ICT, Humanities, Science, Arts, Languages, PE and Learning Support Faculties. The aim was to explore tools and approaches with our own classes, then cascade effective uses back to our teams during planning meetings. This worked really well to the extent that there was low pressure, lots of goodwill, wide coverage of exploration and many examples to share. 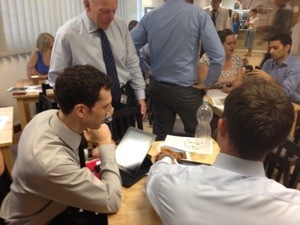 It also meant that I had a close view on what was being tried across the whole school and could connect subjects together who were trying similar approaches. One drawback was that the champions did not necessarily have much ‘clout’ in their own teams to embed processes that appeared to be effective. More importantly, many curriculum teams’ meetings were so infrequent or admin-heavy that discussions of pedagogy and technology were simply not a priority. Where teams met as often as every week this was far less of an issue and therefore opportunities for iPad use were frequently discussed and put into Schemes of Work on the fly. The result in some other departments was that pockets of teachers were beginning to use certain tools but others were quite happy to not attempt to do so, opening up quite a contrast between the learning experiences of students in different classes and also leading to tensions and insecurities around internal monitoring ie ‘well there’s not much in their exercise books’ when actually great feedback was being given using Showbie, for example. Let me make a slight diversion now to talk about chronologically parallel developments in our school, as they have profoundly impacted the way technology will be viewed and supported in the future. Firstly, 5 years ago we introduced the IB as an option alongside A levels in the Sixth Form. There is no question that the IB learner profile attributes of ‘resilient inquirer’ and ‘risk-taker’ conflicted with a feeling that much of our historical success in content delivery and exam success was perhaps more down to skilled ‘spoon-feeding’. How would/could these two approaches co-exist? Secondly, three years ago our then Head of Teaching and Learning introduced an important change to our internal lesson observation process. 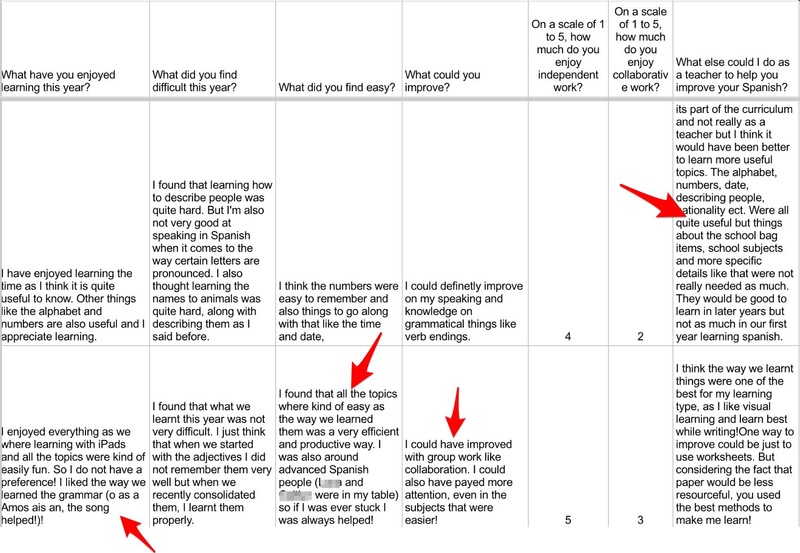 The overall grade was removed so that these became a two-way conversation about learning rather than a one-way ‘judgement’. Then more recently, teachers have been put into random trios across Faculties and responsibility bands to peer-observe, meaning that this is also no longer a top-down ‘senior or middle-manager observes subordinate teacher’ process. The net result is that teachers have had the licence to be risk-takers in their own pedagogy. Thirdly, an ongoing programme of Teaching Tips delivered at staff briefings has reinforced the message that it is not ‘showing off’ to talk about what you are doing in the classroom. 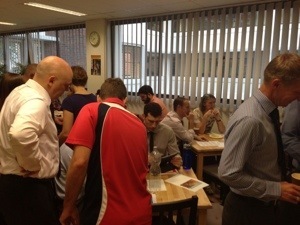 (Remember, this is a school of mostly British teachers!). This has led to an increasing number of teachers and departments embarking on Twitter, Google+ and YouTube to replicate their idea-sharing to a wider world. Lastly, we as a Senior School adopted the IB’s 5 Approaches to Learning for use across all grades and coming right up to date, we have just been discussing what opportunities and challenges the abandonment of National Curriculum Levels in the UK might afford us for further innovation in teaching, learning, assessing and reporting. We did speak to teachers a couple of years ago about using the SAMR model as a way to move from ‘trying out’ new technologies to planning and anticipating their effectiveness ahead of time, but I don’t think we were particularly successful in this as was just before the whole explosion of pedagogy-centred conversations started taking place, and technology was still being seen as ‘bolt-on’ and/or optional in some quarters. So, lots of elements in the school have been percolating to inspire and effect pedagogical change. All of this came to a head in November, when we had a half-day release as the Technology for Learning Faculty to consider how to move use of technology ‘From Exploration to Integration’. Two simple ideas emerged crystal-clear from the day’s activities and discussions. Firstly, if the goal was for technology to enhance and transform the learning experiences of EVERY student, then EVERY teacher had to be a champion, not just the technology reps. Secondly, that if technology was to be seen as a pedagogical tool like any other, it had to be managed and approached as a subset of teaching and learning. Ultimately, the person ‘accountable’ for teaching and learning in each subject is the head of that subject. After further discussions with Senior Leadership, these two fundamentals were agreed. Starting in the new academic year, myself and my assistant Head of Faculty will will meet with Heads of Subjects to discuss learning goals for that subject and plan appropriate support/professional development. A good model for this, and one that contributed hugely to the definition of this new structure, was that the Assistant Heads of History and English both volunteered to be the tech reps in their depts this year. This meant that one or two clear goals were chosen from their departments’ own action plan for the year, we then planned professional development and curriculum integration with the HOD, and all members of the department moved on with this together. Logically, given the focus of my role on professional development, I will be line-managed by the Assistant Head responsible for Teaching and Learning. Now that we are on the verge of a new era where reference to technology will ideally becomes less and less explicit, I have made a start, in collaboration with colleagues, on creating a document that will enable teachers to START from a point of view of considering a particular Approach to Learning they want to focus on, let’s say Thinking Skills, and then be able to refer to real examples of the kinds of learning experience (and apps) that might support this. The columns will be populated over time with Enhancement and Transformation examples. The current blank areas do not indicate an absence of ideas or links, just time! My way of interpreting where the crossover lies between these two strands, even if not totally perfect, is to think of Enhancement as ‘almost certainly worth doing if there is some efficiency or productivity gain, likely to be teacher-led, most likely to be an experience that is at individual student level/maybe student plus teacher, helping one’s own learning’. Transformation level experiences I tend to see more as ‘ likely to be student-led, initiated or developed, most likely in collaboration with others, involving creation and publication of authentic, original work, helping one’s own and others’ learning’. We chose not to have a separate column for each of the 4 levels of SAMR, partly for ease of reading and partly because we feel you can get too hung up on which column a particular learning experience might fit into rather than seeing the big picture. Here is the document in it’s current state..we would love to get any feedback on it and/or on any of my musings above! 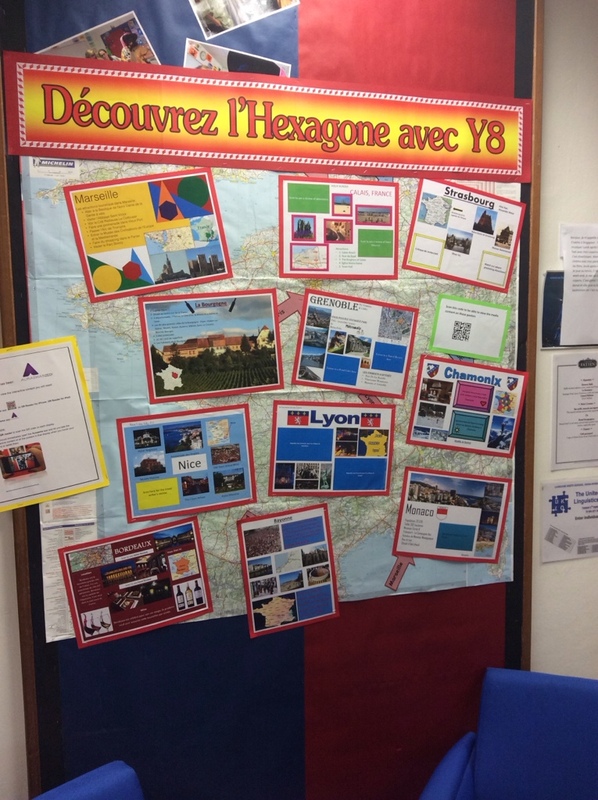 Am very happy with the interactive displays my two Year 7 classes made with Aurasma. Having learnt the joy of conjugating regular verbs in the Present tense, they had to work in pairs to choose their own verb, then make a poster with a blank frame where they then set up a video explaining how to conjugate that verb using a particular subject pronoun. Students used a variety of iPad apps for this. Some used Explain Everything, some used the video camera to film themselves talking or moving bits of paper around, others used stop motion apps. All then uploaded their videos to our Aurasma channel. ¡Fenomenal! Proud of my Year 8 students! Their brief was to work in pairs to create a poster of their chosen French town or city, incorporating one or two windows where videos would play when scanned with the Aurasma app, revealing narrated slideshows of them in the role of food, hotel or travel writers…and applying the recently learned Perfect Tense in a creative context. The students loved doing this and the results literally speak for themselves! 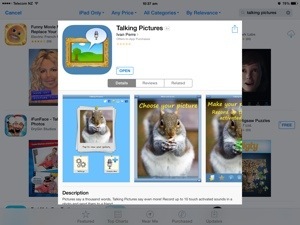 I used this app in the last week of term..in an observed lesson! Students had drafted a letter in Spanish to one of the three wise men (Spanish tradition) and they then recorded this using the chatter pix app and posted on edmodo. They then listened to another and had to identify what gifts were being asked for, seeing if they could get all three details ie item, brand, colour or other adjective. The app works by drawing a line across a mouth on a picture, then recording student voice and saving to camera roll as video. Great fun, and of course when students know their work will be listened to by peers, greater effort is put in to make something accurate and impressive! Have come across this app, plan to use it in the new year to have students record themselves labelling parts of photos they find or take. This could be at word level, ie what’s in my bedroom, but could of course be extended to sentence level ie students record a sentence saying what is happening over key actions shown. 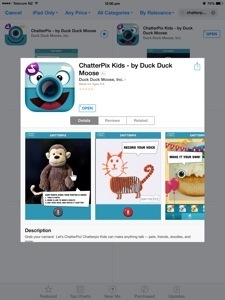 Students can tap and add speech to up to 10 spots on the picture. In terms of sharing with the rest of the class, they can email themselves the file, open email on their iPad, hold down the file, choose ‘open in’ and select edmodo to add to a post. 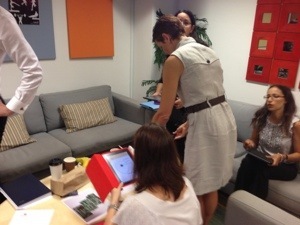 Language learning with the iPad..has everything changed for MFL teachers? Week 2 of our new school year and I am ready to start posting again. 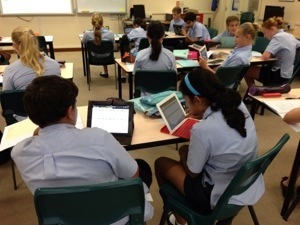 The iPad pilot is over and we now have all students in Y7 and 8 bringing their own. The only support issues so far have been helping some new parents set up Apple IDs and accounts. It is such a privilege to have these powerful tools available to students whenever they need them and because of that I already feel seriously cheated when teaching my Y9 class as they don’t have them yet! One of the daily challenges now- both exciting and intimidating- is working out, with so may possibilities on hand, just how to maximize the potential of 1-1 access. An example that we discussed among language teachers today was how best to use teaching time and technology options when introducing new vocabulary to students. Traditionally, new vocab has been introduced in a teacher-dependent way, and at a speed chosen by the teacher, often with chanting or repetition, games, and almost always accompanied by visuals of the vocab either on real flash cards or more recently on Powerpoints or flipcharts. Students often then copied the vocab from the board. Teachers took in the exercise books, corrected any copying mistakes and then wrote ‘Nice, neat notes, Jemima!’ This method has ‘worked’ for years. In my lessons this week I have abandoned this method. In both of my beginner Spanish lessons this week I have had half the class learn and play the built-in games with the new ‘what’s in my schoolbag’ vocab on quizlet, wearing headphones, listening to the new words, looking at the spelling, hearing the sounds and repeating them. Their scores are visible as they have signed up for Quizlet. After initial shyness at speaking aloud, lots of encouragement saw them lose their inhibitions and the room was soon filled with the sound of independent, intensive authentic imitation. The other half of the class had built a dialogue in pairs last lesson with the previous simple greetings vocab, checking their pronunciation with me or with Google translate, then going outside to record themselves using Recording Lite and posting the recordings to Edmodo. After 20 minutes the two groups swapped activities. The last 20 minutes saw us having a great plenary where we were able to come together, slow down and draw out, discuss and note down some key concepts of the day..in this case how to identify Spanish noun genders by the last letter, some of the trickier pronunciation points ie silent H, double L sound, forming negatives with No before the verb (no tengo) etc. 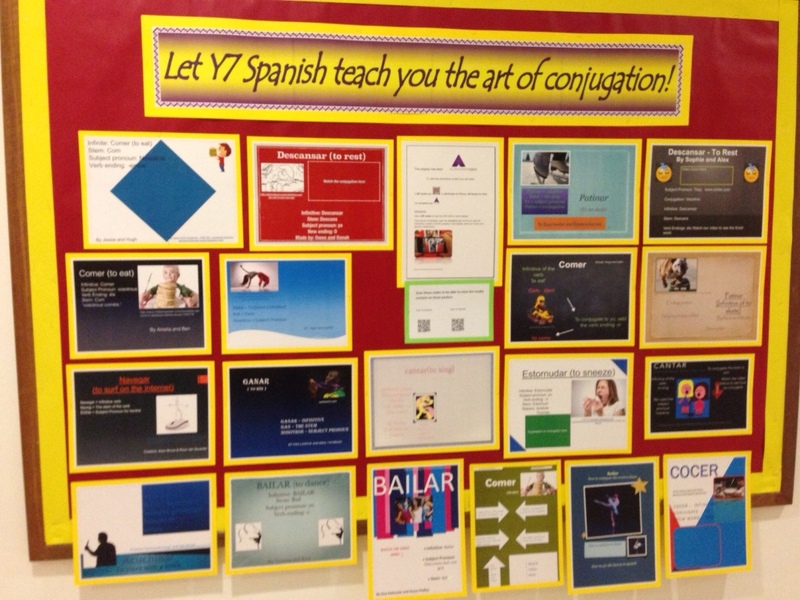 Lots of opportunity here to reward student perceptiveness with our department languages superstar cards. We finished with a really fun, competitive and increasingly challenging Blockbusters game which resulted in a thrilling draw as the bell went..
Next lesson I will repeat the idea of split-class teaching, having half the class peer-assess the other half’s recordings while I do reinforcement speaking games with the rest, then swap again. So, the question is, given access to the internet, is there still a place for students copying vocab from a board or a textbook or is class time better spent on speaking, listening and creating? 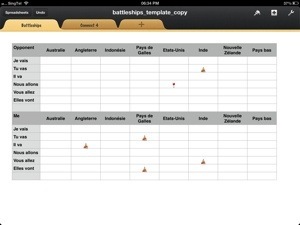 Enjoyed today with my French students..one activity on today’s rotation was for them to play the classic battleships game to reinforce key vocabulary of Aller plus country names, using the template I had put together on Apple’s Numbers app, probably one of the least exploited apps from last year’s pilot. The benefits of having it on the iPad were several-fold: using the pop-up menu of the app students could tap the blank cells where they wanted to place their boats. Once the game was started, each player could guess where their partner had a boat hidden and, depending on the answer, could register a hit or a miss, again using the pop-up menu. After 10 minutes, whoever had located the most boats was the winner, and it was then a cinch to ‘clear the board’. One thing more..the partner had to agree that their opponent had used the correct preposition of en, au or aux before their chosen country…. Well, this has been quite a journey..I have been trawling the web and my twitter PLN to exhaust all the free possibilities for students to record their voice and share with others via a URL rather than a large audiofile. It’s not that this hasn’t been possible; in fact, for some time I have been promoting ShowMe and Educreations as they are ridiculously quick and easy to use ways to produce a recording with a public or private URL. However, it has always bugged me -perhaps unreasonably- that the URL shared opens an app instead of just playing an audio track. Similarly, it has always been possible to record audio in one app like Voice Record Pro (free) and upload to a free cloud storage platform like Google Drive, Dropbox or Copy. Copy for iOS is my favourite as it gives 15GB free and the iPad app is fab, every file and folder has a private or public link. But, again, I just want the audio URL to play, not open an app or require a download. Fussy or what? A decent alternative has been the Croak.it app, which is free and produces its own URL, but it only allows up to 30 seconds recording. Actually that is quite a long time for a Y7 or 8 student..and they could of course, make two or more recordings. Numerous other options, such as iPadio, Audioboo and Soundcloud required signing up to social media sites or providing phone numbers, which is not ideal when students are not yet 13. 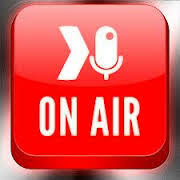 The free app Spreaker DJ, however, as tipped by @joedale and @suzibewell, might fit the bill. It does need a subscription but nothing in the Terms and Conditions mentions an age limit. I will give it a go and report back! My TFL (Technology for Learning) colleagues and I took the plunge and ran an introduction to Augmented Reality session with the whole Senior School staff this morning as our contribution to the weekly internal staff teaching tip programme we have. After thanking the TFL team and all staff for making our iPad pilot year such a success, I briefly explained the concept and potential of augmented reality and then we let everyone loose. Obviously, as images can link to anything, the wider potential across the school is huge…pop-up instructions on how to use PE, Science or first-aid equipment, interactive points around the school for visitors, talking departmental and option evening displays, singing concert posters…you name it. The technology worked flawlessly and there was a really good buzz. Best outcome? I could see quite a few teachers trying straightaway to make their own auras and many others came up and demanded training!! Always the best way round for CPD! Student tech leaders in action again.. 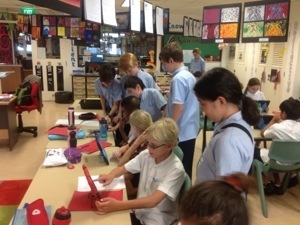 In weeks 4 and 5, during our senior lunch hour, we (the team of 20 Year 7 student tech leaders) visited the Year 6 unit to give students a taster of Edmodo, the Senior School’s social learning network. 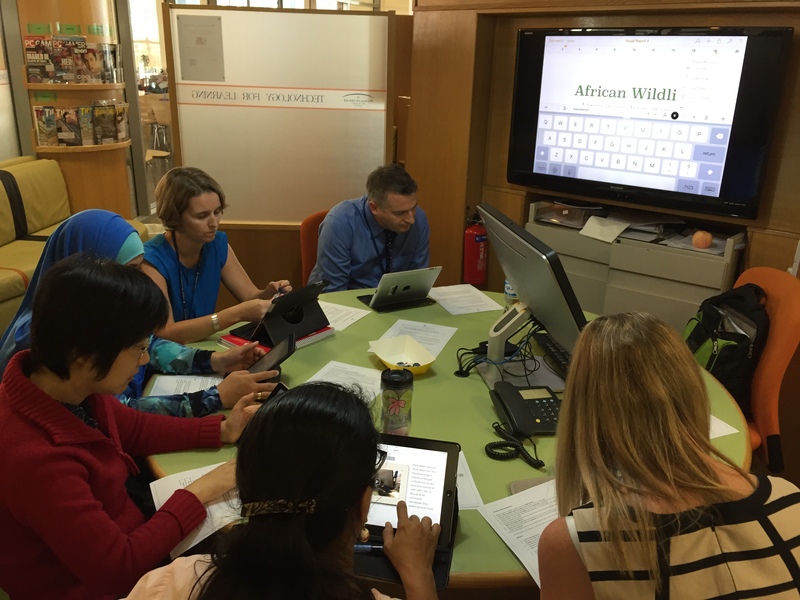 The Technology for Learning teachers, assisted by the Head and Assistant Head of Year 7, Mr Edwards and Mrs Biddles, started by explaining how the platform is used in the Seniors, then walked the students through the signup process. Then we all helped the Juniors complete a scavenger hunt activity in which they needed to find found out for themselves how to use the key functions of Edmodo. We noticed that the Juniors couldn’t help but use text talk and emojis to begin with but they soon got into good habits! They were obviously right at home with this platform and were excited by it. This time next year some of them will be helping the next lot of Juniors use Edmodo!